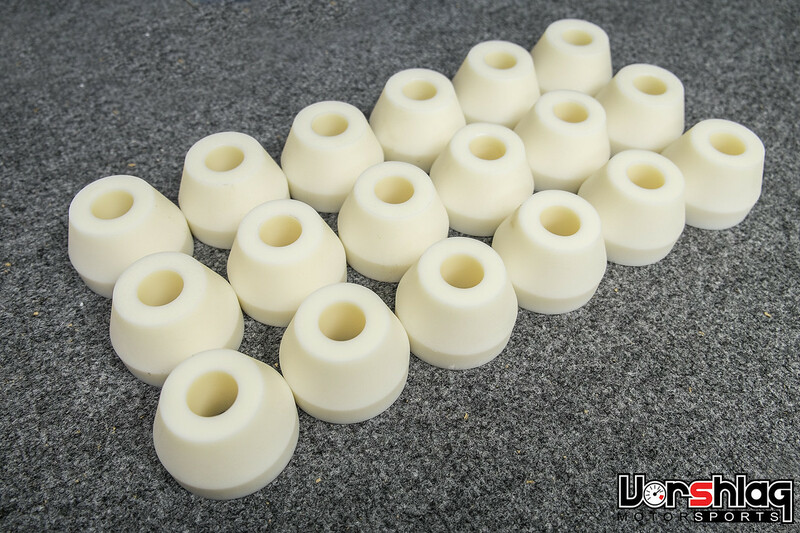 This catalog entry is for a pair of Vorshlag Nylon INSERTS to convert an existing set of E36/46/E92 M3 Competition Polyurethane motor mounts to the harder Nylon. This will upgrade an existing set of Competition motor mounts to a more track-duty version. Yes, these Nylon inserts will add more NVH (Noise Vibration Harshness) compared to the stock mount or even our Poly version Competition Motor Mounts, but radically stiffen driveline mounting, for hugely improved shift feel and throttle response over OEM mounts. The Nylon-6 material we use for these inserts is a White Shoreline 70D durometer material - ("bolwling ball hard"). Compare this to the available Polyurethane red material that is Shoreline 50 D durometer ("Stiff"), or Shoreline 95 A. For a track-only car this is the material you want for the most precise shift feel and more instantanous throttle response. Again: this catalog entry is for a pair of Nylon inserts only! Must already have Vorshlag Polyurethane Competition Motor Mounts to convert.